The magician takes a coin from the left hand to the right and raises the right hand over his head, gazing at it with incredible intensity. With a magic word the magician opens the right hand and the coin is gone. Where was the left hand all this time? The left hand has been quietly performing the actual magic while the magician’s manner and behaviour directed the audience to look the other way. A magician uses misdirection in every trick he or she performs. The name itself is a great definition - mis or incorrect, direction. If you stopped on the road and asked for directions to a restaurant and were instead given directions to a hotel, you have been misdirected (and are likely pretty upset.) When a magician looks one way or another, raises a hand, points a finger or even says “look here” he is more often than not misdirecting the audience, getting them to look away from where the "magic" is taking place. Many times the magic may not be revealed even if the audience looked right at it happening, but misdirection comes so naturally to a magician that it happens all the time regardless. Misdirection in magic is getting the audience to look at what the magician wants them to look at, to pay attention to something that seems as if it is relevant to the trick, but often is not. Many times when the magician says the magic is happening it is way after the fact, just a bit of acting and misdirection so that the audience won’t think back over the trick and discern its secrets. 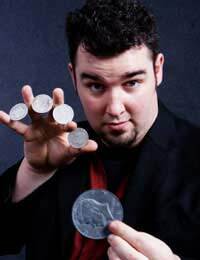 How many times have you seen a magician take a coin from one hand to the other? Most of those times it only appears as if he has taken the coin, actually retaining it in the original hand - but everything about him suggests that he has taken the coin. The hand that first held the coin falls to the side, held loose and open, forgotten, as the magician’s body turns to the other side, the hand that “took” the coin is raised high, the eyes stare at the hand and the magician says “now I will make the coin vanish” - even though it isn’t there at all. Most people will look where they are directed to look, pay attention to what they are directed to pay attention to - and this is perhaps the greatest weapon in the magician’s arsenal. A magician has to SELL misdirection effectively. Not a hard sell, because most people back up and throw up defences when faced with a hard sell. The best sales people get their customers to buy because they convince the customers that they are the ones making the decision - a magician with misdirection works the same way. He may say “look at my hand” but it is done with such a natural, innocent manner that the audience does not realise it is being misdirected. Misdirection must be subtle, even when the directing is obvious. Need more tricks to be added for better interest.